Peritoneal dialysis (PD) is a form of renal replacement and is based on the use of the peritoneum as a semipermeable membrane across which ultrafiltration and diffusion take place. Nevertheless, continuous exposure to bioincompatible PD solutions and episodes of peritonitis or hemoperitoneum cause acute and chronic inflammation and injury to the peritoneal membrane, which progressively undergoes fibrosis and angiogenesis and, ultimately, ultrafiltration failure. The pathophysiologic mechanisms that are involved in peritoneal functional impairment have remained elusive. Resident fibroblasts and infiltrating inflammatory cells have been considered the main entities that are responsible for structural and functional alterations of the peritoneum. Recent findings, however, demonstrated that new fibroblastic cells may arise from local conversion of mesothelial cells (MC) by epithelial-to-mesenchymal transition (EMT) during the inflammatory and repair responses that are induced by PD and pointed to MC as protagonists of peritoneal membrane deterioration. Submesothelial myofibroblasts, which participate in inflammatory responses, extracellular matrix accumulation, and angiogenesis, can originate from activated resident fibroblasts and from MC through EMT. This heterogeneous origin of myofibroblasts reveals new pathogenic mechanisms and offers novel therapeutic possibilities. This article provides a comprehensive review of recent advances on understanding the mechanisms that are implicated in peritoneal structural alterations, which have allowed the identification of the EMT of MC as a potential therapeutic target of membrane failure. In the past decades, peritoneal dialysis (PD) has become an established alternative to hemodialysis for the treatment of ESRD, and the number of patients who are in PD programs has increased progressively worldwide, especially in some Asian countries. One of the most important challenges in PD is the long-term preservation of the peritoneal membrane integrity.1,2 Damage to the peritoneum is a serious event in PD, because it may jeopardize the organ on which the whole treatment is based.1–3 The morphology of the peritoneum is simple; A single layer of mesothelial cells (MC) covers a submesothelial region that is composed of connective tissue with few fibroblasts, mast cells, macrophages, and vessels.4 The nonphysiologic nature of dialysis fluids and the uremic status are considered the main etiologic factors that lead to the functional decline of the peritoneal membrane.1 They induce a sustained situation of peritoneal chronic inflammation that can be exacerbated periodically by recurrent or acute episodes of peritonitis or hemoperitoneum. Closely linked to the inflammatory response is the reparative process. Its activation is responsible for many of the structural abnormalities of the peritoneal membrane, including loss of MC monolayer, submesothelial fibrosis, angiogenesis, and hyalinizing vasculopathy.5–8 Such alterations are considered the major cause of ultrafiltration failure and loss of the dialytic capacity of the peritoneum. Recent works have begun to identify the mechanisms that are involved in the pathogenesis of peritoneal membrane failure during long-term PD. Resident stromal fibroblasts and inflammatory cells have been classically considered the main cells responsible for structural and functional peritoneal alterations, whereas MC have been considered mere victims of peritoneal injury. However, more recently, it has been shown that MC also play an active role in peritoneal membrane alteration. 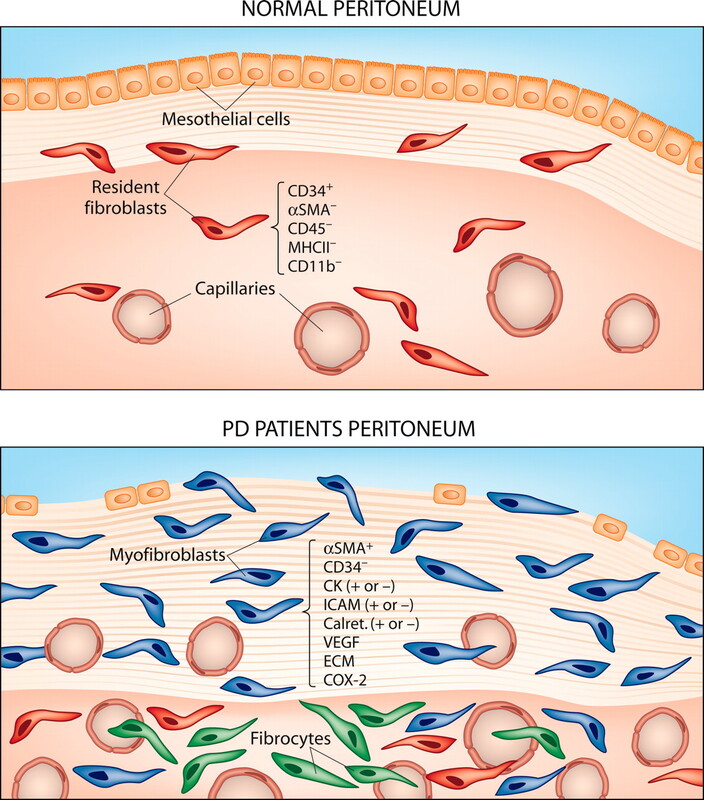 It has been demonstrated that, soon after PD is initiated, peritoneal MC show a progressive loss of epithelial phenotype and acquire myofibroblast-like characteristics by an epithelial-mesenchymal transition (EMT).11 MC that have undergone an EMT acquire higher migratory and invasive capacities, which allow these cells to invade the submesothelial stroma, where they contribute to peritoneal fibrosis and angiogenesis and ultimately lead to peritoneal membrane failure.11–13 The myofibroblastic conversion of MC has been confirmed in an in vivo animal model based in the injection of an adenovirus vector that transferred active TGF-β1 in rat peritoneum.14 In these studies, EMT appears as the central point in the early pathogenesis of peritoneal damage associated with PD. Given that there is no definitive treatment for the progressive loss of the dialytic capacity of the peritoneum, the identification of the EMT of MC as a key process in the onset and progression of peritoneal fibrosis and angiogenesis opens new insights for therapeutic intervention. It is worthy of remark that our understanding of peritoneal functional outcome in response to PD requires a deep knowledge of the starting point because of initial functional diversity of the human peritoneum. It can be hypothesized that the diversity in solute and water transports at PD initiation may represent different tissue responses to similar components of dialysates. Furthermore, different starting points followed by diverse reactions to PD at midterm can generate a wide spectrum of peritoneal morphofunctional scenarios.17 After molecular and cellular biology studies of the intimate processes that take place into the peritoneum, a refinement in therapeutic strategies is expected. Therefore, it can be proposed that the fourth decade of PD should be conducted to explore molecular aspects of the peritoneal response. Exposure to bioincompatible fluids and episodes of bacterial and fungal infection or hemoperitoneum induce situations of acute and chronic inflammation that cause damage to the peritoneal tissue. The successful repair of injured tissue requires a tightly controlled response to limit the structural alteration. The peritoneal immune response to injury or infection involves, among other cells, MC and resident macrophages that work in a coordinated manner to recruit other inflammatory cells, including mononuclear phagocytes, lymphocytes, and neutrophils.18 MC and infiltrating immune cells can produce a wide number of cytokines, growth factors, and chemokines to establish a complex network that feeds back, resulting in acute or chronic inflammation, which leads to membrane deterioration.18–21 Many of these inflammatory mediators, such as TNF-α, IL-1, IL-8, TGF-β, and fibroblast growth factor-2 (FGF-2), may have a role in peritoneal fibrosis by stimulating resident fibroblasts proliferation and extracellular matrix (ECM) component deposition22 and by inducing EMT of MC,11 which further increases the number of peritoneal fibroblasts.12 In addition, IL-8, FGF-2, and especially vascular endothelial growth factor (VEGF) may induce an increase of peritoneal capillary number and probably vessel permeability,13,19 causing an increase of small-solute transport, which characterize ultrafiltration failure. Even in the absence of infection or hemoperitoneum, it is thought that PD patients have a low-grade chronic inflammation that promotes a progressive structural alteration of the peritoneal membrane. This could be due to the mechanical injury during PD fluid exchanges and also to nonphysiologic composition of the fluids. Prolonged exposure of the peritoneum to glucose, the most common osmotic agent in PD fluids, or to Amadori adducts, formed by the condensation between glucose and reactive amino groups of proteins, induces the synthesis of inflammatory, fibrogenic, and angiogenic factors by macrophages23 and MC.24,25 Glucose may also promote peritoneal inflammation through a leptin-dependent mechanism.26 In this context, adipocytes that are exposed to glucose produce leptin, which in turn promotes TGF-β production by MC.27 This evidence suggest that peritoneal inflammation is a key triggering process for peritoneal membrane failure; therefore, the knowledge of the mechanisms that are involved in its regulation may serve in the design of therapeutic interventions. Subpopulations of peritoneal fibroblasts in peritoneal membranes of normal and peritoneal dialysis (PD) patients. (A) The morphology of normal peritoneum is simple, with a single layer of mesothelial cells (MC) that covers a submesothelial region that is composed of connective tissue with few fibroblasts and some vessels. In normal peritoneum, myofibroblasts are not present, whereas resident fibroblasts show an intense expression of CD34, an antigen that is characteristic of bone marrow stem cells. Peritoneal CD34+ fibroblasts do not express fibrocyte markers, suggesting that they are simply residual embryonic mesenchymal cells that remained in the peritoneal tissue after organogenesis. (B) In PD patients, there are many structural abnormalities of the peritoneal membrane, including loss of MC monolayer, increased number of fibroblasts, submesothelial fibrosis, and augmented vessel number. In contrast to normal peritoneum, myofibroblasts can be easily detected in the peritoneal membrane of many patients who undergo PD. The myofibroblasts may originate from activated resident fibroblasts, from circulating cells (fibrocytes), and from MC through an epithelial-to-mesenchymal transition (EMT). The myofibroblastic conversion of MC can be observed by immunohistochemical analysis, which reveals the presence of fibroblast-like cells embedded in the compact zone expressing mesothelial markers such as cytokeratins, intercellular adhesion molecule-1, and calretinin. Peritoneal myofibroblasts express vascular endothelial growth factor (VEGF), extracellular matrix (ECM), and cyclooxygenase-2 (COX-2), indicating that these cells are implicated in peritoneal structural alterations that are induced by PD. The proportions of peritoneal myofibroblasts that originated from resident fibroblasts, circulating fibrocytes, and MC remain to be established. Turning an epithelial cell into a mesenchymal cell is a complex and step-wise process that requires alterations in cellular architecture and behavior and a profound molecular reprogramming with new biochemical instruction.36–38 As illustrated in Figure 2, the EMT starts with the dissociation of intercellular junctions, as a result of downregulation of adhesion molecules such as E-cadherin, claudins, occludins, zona occludens-1, and desmoplakin, and with the loss of microvilli and apical-basal polarity. Then, the cells adopt a front-back polarity, as a result of cytoskeleton reorganization, and acquire α-SMA expression and increased migratory capacity. In the latest stages of EMT, the cells acquire the capacity to degrade the basement membrane and to invade the fibrotic stroma by upregulating the expression of matrix metalloproteinases (MMP). Other commonly used molecular markers for EMT include the downregulation of cytokeratins; upregulation of vimentin, N-cadherin, and transcription factor snail; and increased production of ECM components. Key events during EMT. 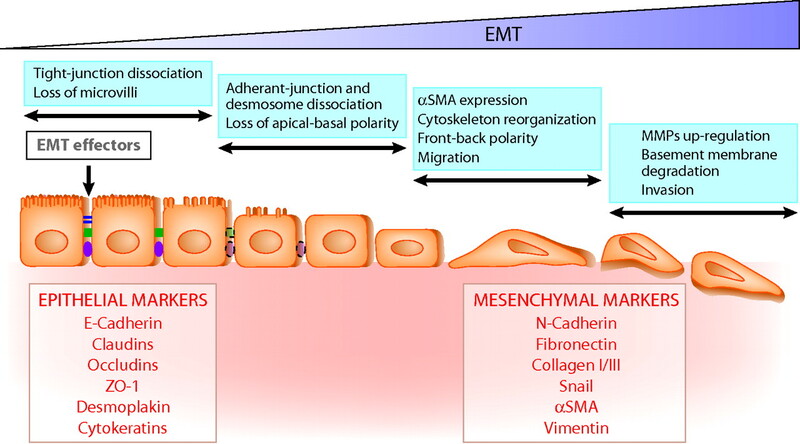 The diagram shows four key steps that are essential for the completion of the entire EMT course and the most commonly used epithelial and mesenchymal markers. Besides these classic markers, there are some other markers as well as a number of biochemical changes that define the EMT (summarized in Table 1). EMT can be easily engaged by combinations of a wide spectrum of extracellular stimuli, including cytokines, growth factors, AGE, MMP, and ECM components such as collagen I. It is worthwhile to point out that most of these EMT regulators have been identified by using in vitro cell culture system in which epithelial cells were treated with purified factors, either alone or in combination, at high concentrations. These fractionated studies, although necessary to define the potential role of each individual factor in regulating EMT, did not mimic the real situation in vivo, in which the EMT regulators are present at low concentrations. Therefore, an EMT in vivo may result from an integration of diverse signals triggered by multiple factors, being difficult to assign priorities or hierarchy. The presence of EMT in the peritoneum of PD patients was first demonstrated in a landmark paper that published in 2003.11 It was described that confluent MC cultures from PD effluents may show epithelioid and nonepithelioid (fibroblast-like) morphologies. The frequency of nonepithelioid MC was associated with time on PD and with episodes of peritonitis or hemoperitoneum. MC from effluents showed high expression of intercellular adhesion molecule-1 independent of their morphology. In contrast, this mesothelial marker was negligible on cultured peritoneal fibroblasts, supporting that effluent nonepithelioid cells had a mesothelial origin and were not fibroblast contaminations. The analysis of the epithelial markers cytokeratins and E-cadherin was also important to determine more precisely the nature of effluent-derived cells. High expression of cytokeratins and E-cadherin was observed only in omentum-derived MC, whereas effluent-derived cells showed a progressive reduction in the expression of these molecules, although even fibroblast-like MC maintained a small population of positive cells. Fibroblasts were completely negative for these two markers. The phenotype changes in effluent MC were indicative of an EMT. Additional evidence that the PD-induced changes of the MC were due to an EMT came from the analysis of the expression of the transcription factor Snail, a potent inducer of EMT. Omentum-derived MC did not express Snail mRNA, whereas a progressive expression of this mRNA was observed in effluent MC preparations along the transdifferentiation process.11 Besides these molecules, there are some other markers that may help to distinguish effluent MC from contaminating fibroblasts as well as to establish the various stages of transdifferentiation of MC (summarized in Table 2). It has been shown that during the progression of EMT, MC acquire higher ex vivo and in vitro ability to synthesize components of the matrix, such as fibronectin and collagen I.13 In addition, MC that undergo an EMT express high levels of cyclooxygenase-2 (unpublished data, Aroeira et al. ), which has been implicated in tissue remodeling and fibrosis processes.40 Furthermore, it can be observed that the grade of peritoneal fibrosis and small-solute transport rate of PD patients correlate with the expression of mesothelial markers within the fibrotic stroma (unpublished data, del Peso et al.). These results support the notion that transdifferentiated MC play an essential role in the initiation of fibrosis and subsequent peritoneal functional decline. The insights of the molecular mechanisms that regulate chronic inflammation that is induced by peritoneal injury will allow the identification of potential therapeutic targets. However, from the clinical nephrologist's point of view, perhaps the most important aspect is the identification of the EMT of MC as a key event in peritoneal membrane failure, because this process can be manipulated with a wide range of agents and pharmaceutical products.37 The therapeutic strategies may be designed either to prevent or to reverse the EMT itself or to treat its effects such as cellular invasion, ECM accumulation, or angiogenesis factor synthesis. Therapeutic strategies for peritoneal membrane failure based on EMT of MC. EMT of MC in vivo results from integrated signals that are induced by multiple stimuli. These include elevated glucose and glucose degradation products (GDP) and concentration of PD fluids, which through the formation of advanced glycation-end products (AGE) stimulate the transdifferentiation of MC. The formation of AGE may also be due to the uremic status of the PD patients. The low pH of the dialysates and the mechanical injury during PD fluid exchanges may cause tissue irritation and contribute to chronic inflammation of the peritoneum, which promote EMT of MC. Episodes of bacterial or fungal infections or hemoperitoneum cause acute inflammation and upregulation of cytokines and growth factors such as TGF-β, IL-1, fibroblast growth factor-2 (FGF-2), TNF-α, and angiotensin II (AngII), among others, which are strong inducers of EMT. The therapeutic strategies may be designed either to prevent or to reverse the EMT itself or to treat its effects such as cellular invasion, fibrosis, or angiogenesis. The diagram illustrates six steps related to the EMT process of the MC that can be clinically managed, alone or in combination, to prevent peritoneal membrane failure. See text for details. It should be taken into consideration that EMT of MC is a physiologic process that is necessary for wound healing during the aggression of the peritoneal membrane induced by PD; therefore, it is plausible that chronic blockade of EMT would result in inefficient tissue repair. 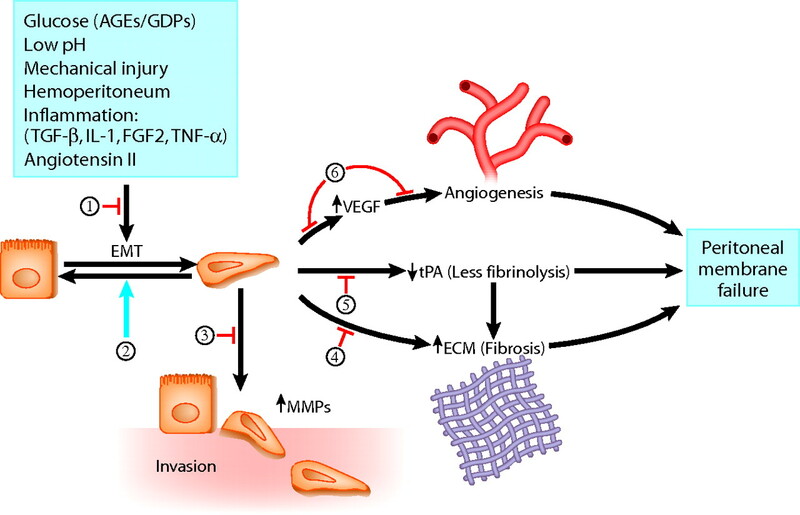 Therefore, alternative therapeutic approaches may be addressed to treat the consequences of the EMT of MC, such as cellular invasion (step 3), fibrosis (steps 4 and 5), or angiogenesis (step 6; Figure 3). Induction of EMT of MC is accompanied by upregulated expression of MMP such as MMP-2 and MMP-9, which would degrade the basal membrane and the connective tissue, allowing the submesothelial invasion by the transdifferentiated cells.14 It can be expected that MMP inhibitors may prevent the accumulation MC-derived myofibroblasts in the submesothelial compartment, which in turn would diminish the structural alteration of the peritoneal membrane (step 3). Recent studies using ex vivo cultures of effluent-derived MC, in conjunction with immunohistochemical analysis of peritoneal biopsies, have allowed the identification of the EMT of MC as a key process in peritoneal membrane failure. Although it can be argued that effluent MC are not representative of the mesothelium because they might be cells that are committed to detach from the tissue, there is increasing evidence that MC that are released into PD effluent are representative of the MC population that remains attached to the peritoneum. In fact, it could be demonstrated that effluent-derived MC reflected more precisely the functional status of the peritoneal tissue than previous tests. It can be expected that proteomics and functional genomics analysis of the EMT process of MC will provide fine biomarkers for accurate follow-up of the progressive peritoneal membrane deterioration and for the identification of master molecules that govern the mesenchymal conversion of MC. These molecular profiles of the EMT process might also become excellent tools to test the biocompatibility of new PD fluids, both in in vitro studies and in animal models of PD. In addition, the increasing knowledge of the events that culminate in EMT and its consequences will provide future hope for long-term preservation of peritoneal membrane through the development of preventive and therapeutic approaches. However, the design of new therapeutic strategies still requires extensive analysis, in vitro and in animal models, of the various drugs and factors with potential effects on EMT and its deleterious consequences before starting with clinical trials. This work was supported by grant FIS 03/0599 to R.S. and by grant SAF 2004-07855 to M.L.-C. This work was also partially supported by Fresenius Medical Care and by a research award from Fundación Instituto de Credito Oficial to M.L.-C.
Should Peritoneal Resting be Advised in Ultrafiltration Failure Associated with a Fast Peritoneal Solute Transport Status?